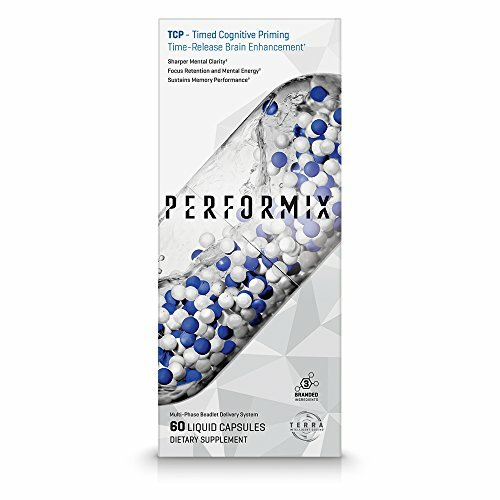 PERFORMIX TCP - Timed Cognitive Priming is designed for the individual who knows that true high-performance demands more than just physical excellence. This time-release cognitive enhancement formula provides clarity of mind and superior focus so that you have the energy, drive and mental acuity to tackle any obstacle, in fitness and in life. Every PERFORMIX supplement is driven by our TERRA Intelligent Dosing technology. We use bioavailability enhancers, maximizing every single molecule's potential. Our mission is to out perform, out last and out do. TERRA Coating is an innovative Multi-Coating Matrix (MCM) technology that targets pH extended release functionality. This offers an advanced delayed release coating system designed with multiple release points to help maximize ingredient performance. SHARPER MENTAL CLARITY: TCP provides holistic mental support powered by Sensoril and Teacrine, which promote clarity, concentration and alertness while our anti-stress formulation promotes overall emotional well-being. SUSTAINS MEMORY PERFORMANCE: Huperzine A helps prevent the breakdown of key neurotransmitters in the brain, sustaining effective memory performance. FOCUS AND MENTAL ENERGY: Never hit the wall again. TCP is time released to provide mental fuel for the entire day, consistently boosting energy levels and resisting fatigue. PRODUCT USAGE: Take 2 capsules in the morning to support mental performance. If you have any questions about this product by PERFORMIX, contact us by completing and submitting the form below. If you are looking for a specif part number, please include it with your message.